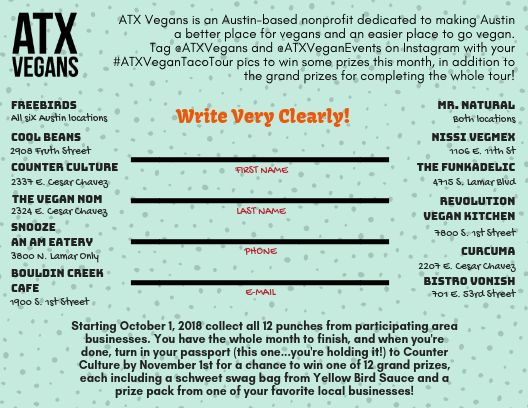 ​Breakfast, Lunch, Snacks and Dinner: Austin loves its tacos & it sure does love its vegan food, so we smashed them together to create a month-long celebration of local businesses who offer up the best, most delicious tacos in town! We have everything you could want: From Authentic Mexican, to Deconstructed, to Raw! Snooze: An A.M. Eatery (N. Lamar Location) - ask for the ATX Vegan Taco! 5. Every week, we'll hold an instagram contest for those participating - with awesome taco-themed prizes! 6. Collect all 12 stamps by October 31 and turn in your card to Counter Culture on E. Cesar Chavez by the end of the day on Nov 1st. Over the next week, we'll announce the 12 winners of our grand prizes, which will also include swag bags from our sponsor, Yellowbird Sauce. Special thanks to Nefer Calles at Calles Art Expressions for her beautiful work on our Vegan Taco Tour Guide! Austin has some of the best tacos in the world - we know this to be true because of the sheer number of Mexican-owned businesses in this town who push out the most delicious food we know. When we created this event, we knew that our participants needed to not only have great food, but offer delicious vegan options. We took the first 12 who raised their enthusiastic hands for the tour and called it a day - that said, there are SO MANY MORE businesses with delicious, authentic options. We'll be sharing their vegan eats on Instagram throughout the month as well, even if they're not participating in this year's Taco Tour. 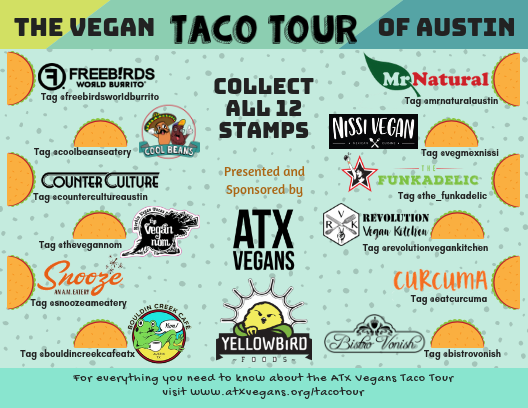 Additionally, if you find yourself at a taco joint in Austin who has a vegan option, but isn't on the tour...if you use our tour hashtag #ATXVeganTacoTour, we'll still count you for that week's Instagram challenge! This is our way of expressing that we KNOW that this list leaves out many amazing businesses, and we recognize all the value they bring to the community in Austin. Let's take this month to celebrate every...single...vegan....taco in our beautiful city.